Heat oven to 325°F. In 9-inch glass pie plate, arrange tortillas, overlapping and extending to edge or slightly over edge of plate. Brush edges of tortillas with melted butter. 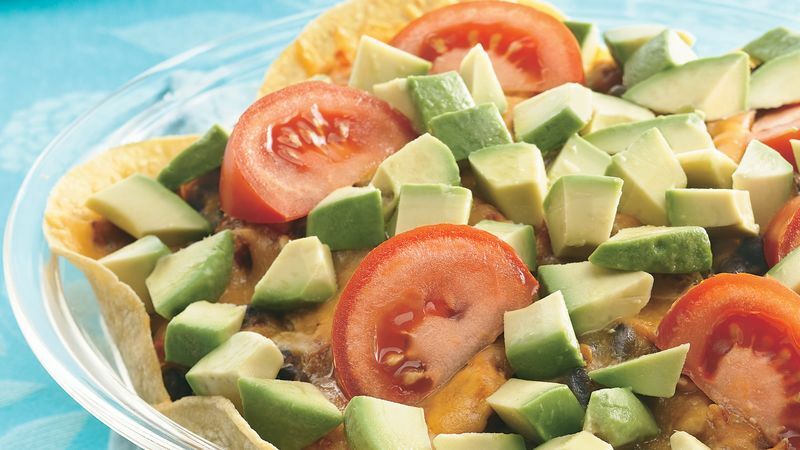 In large bowl, mix chicken, beans, salsa, taco seasoning mix and 1/2 cup of the cheese. Spoon chicken mixture onto tortillas. Bake 25 to 30 minutes or until hot. Sprinkle with remaining 1 cup cheese. Bake 2 to 4 minutes longer or until cheese begins to melt. Top with tomato and avocado. Make sure to use fresh corn tortillas when making this recipe; old tortillas may dry out while baking. If you prefer the taste of flour tortillas, use them instead of corn tortillas.